Joe's comrades who were in jail with him during the protest - Séanna Walsh, and Jim McCann and Seamus Finucane - have urged the Lenadoon community and people from across Belfast to participate in the commemorative events. Jim McCann, who spent four years on the blanket in the wing with Joe, described his dedication to the republican struggle. 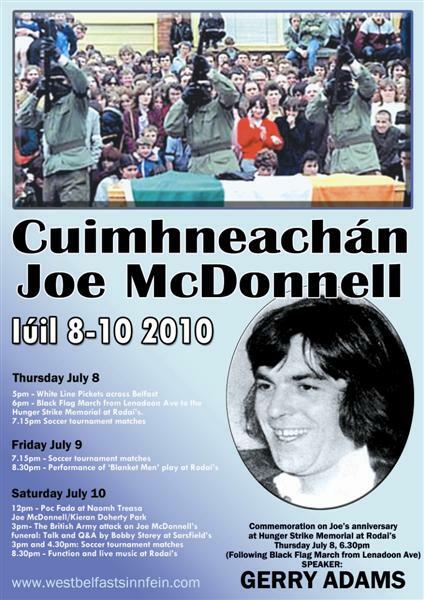 "Joe McDonnell was a deeply committed IRA Volunteer. He was a loving father to his two children and a good friend and comrade to many, many people," Jim said. "Joe was interned twice in the early 1970s and was arrested again while on active service in 1976 along with Bobby Sands and a number of others. He was sentenced to 14 years and upon entering the H-blocks he refused to wear the prison uniform and joined his comrades on the blanket protest. "On May 9, 1981, he commenced his hunger strike, taking the place of his friend and comrade, Bobby Sands, who had died four days earlier on May 5. "In June 1981, during his hunger strike, Joe stood as a candidate in the Sligo/Leitrim constituency during the general election and came very close to being elected. "Today his name and the names of all the other Hunger Strikers continue to inspire people in Ireland and across the world, and we will remember him with pride next Thursday." Leading Sinn Féin activist and ex-POW Séanna Walsh said: "The Hunger Strike was a major turning point in Irish politics. The determination and commitment of the Hunger Strikers at that time has been a watershed in advancing the cause of Irish independence and freedom." Séanna explained the impact of Joe's death on the prisoners during the protest. "After Bobby was elected as an MP, there was an expectation that the Brits could be moved to resolve the situation and meet the prisoners' demands. But this hope faded when Bobby died - then it was a slow and devastating wait for the men after him, as each crossed the line. "As Joe reached the critical stage there was a period of intense negotiations, which involved the Church, the Irish Commission for Justice and Peace, and the back channel between republicans and the British government. Our hopes were raised that the issues that led to the strike could be resolved. "But Thatcher's determination to smash the prisoners' struggle won through and the negotiations failed. At the end of the day, the British government could have moved to resolve the Hunger Strike. The fact is that they didn't, and Joe, and the men behind him, died as a result. "That had a huge impact on the morale of the prisoners. But in no way did it affect our determination to continue with the protest until our rights were respected." Joe's funeral was then attacked by the British Army. "The attack by the British army on Joe's funeral took place in the wake of the massive turnout to Bobby Sands's funeral, and it marked the start of a concerted campaign by the British forces to attack the funerals of Volunteers and republican activists," Séanna said. "Belfast Sinn Féin chairperson Bobby Storey will be speaking at a panel discussion next weekend about the experience of the funerals of the Belfast Hunger Strikers - Bobby, Joe and Kieran Doherty. "There is a huge and enduring interest in this period from people in the community, and in particular from the generation of young people that weren't yet born at the time these events unfolded, and it is these young people who we are especially aiming to draw it to the events." Seamus Finucane, who was arrested with Joe and Bobby Sands after an operation in Dunmurry in 1976, spoke of Joe's courage and humour. "In the lead-up to the 30th anniversary of the Hunger Strike next year, we want to make sure that the men who sacrificed their lives for this struggle are remembered with pride by the communities they fought and died for," he said. "We're urging the people of Lenadoon and the upper Andersonstown, where Joe lived and was active, to come out and show their support for this series of events and to help this current generation of young people get a better understanding of what motivated and inspired people like Joe." The events will be held across Belfast from July 8-10, and include a White-line picket in Andersonstown (outside Connolly House) at 5pm on Thursday. This will be followed by a black flag march from Joe's house on Lenadoon Ave to the Hunger Strike memorial at the Roddy McCorley Club at 6pm, where Gerry Adams will speak. On Saturday (July 10), Bobby Storey will speak on the attack on Joe's funeral at 3pm at Sarsfield's. A soccer tournament, poc fada and play will also be held during the weekend.